A group of business owners in Montreal North is mobilizing to stop a proposed protected bike path from being built, citing safety concerns. But Vélo Québec says the path would actually make it safer for everyone on the road, and calls the reaction "outdated." The path is part of a beautification project that will also cover fixing sewers. It's slated to cost between $15 and $20 million. The bike path would be built alongside Industriel Boulevard, a major artery in the area. Officially, the road has one lane going in either direction, but it's so wide that there's enough space to have two cars side-by-side, according to Roger Elias, the owner of Radiateur Prestige on Industriel. "The problem is, if they shrink that, there will be no more space for the trucks to back up and unload their cargo," Elias told CBC Montreal's Daybreak. Once the protected bike path is built, the width of the lanes available to motor vehicles will be reduced. Elias says this could increase traffic, accidents and cause complications that affect business. "We don't know how cargo will be delivered to the industrial area," he said. "If there's more anger [related to] getting to the business, obviously it's going to affect the business." He says the street is already congested, and that there are accidents there every day. A petition is going around to stop the construction of the bike path, which is scheduled to start in June. 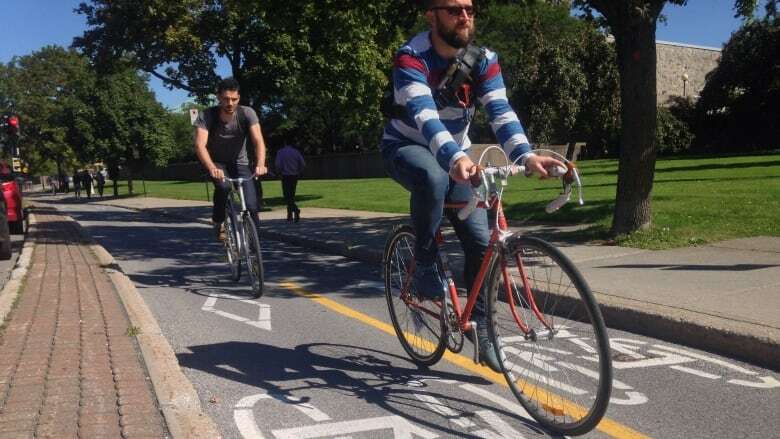 Montreal cycling advocacy group Vélo Québec says that shaving space for motor vehicles off the boulevard's lanes would actually calm traffic, rather than make it worse. "Lanes that are too wide incite people to speed, and that's never good news," said Magali Bebronne, Vélo Québec spokesperson. Bebronne says that for people in M​ontreal North, it's impossible to cycle from east to west without zigzagging through side streets. "Cycling cannot be efficient in that section of Montreal North until we get this kind of infrastructure, until we get a cycle path," she said. The protective barriers alongside the bike path will also ensure the cyclists' safety, as will the engineers who must ensure space for emergency vehicles when designing the path, Bebronne says. "We think that these fears are unwarranted," she said. Bebronne says having the option to cycle there will encourage more people to do so.